Give them the gift of a lifetime with this new line of nickel-free jewelry! 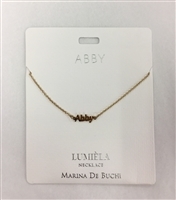 Introducing the Lumiela necklace line by Marina De Buchi! This necklace can extend between 15 to 20 inches for the perfect choker for a night out or the finishing touch at a birthday dinner! Let yourself sparkle!